When I first moved to Rochester in 2012, I kept hearing about Mount Morris. Apparently, a developer who had revived Red Hook, Brooklyn had purchased many of the buildings, restored them, and brought this small village back to life. Well . . . with my background in revitalizing small villages and towns, I was skeptical! Absentee landlords are often a problem, and renovation of buildings without community partnerships can be a recipe for disaster. But at that time, I didn’t know Greg O’Connor, Louise Wadsworth, Pete Bishop, Bill D’Angelo, or Nicole Manapol. 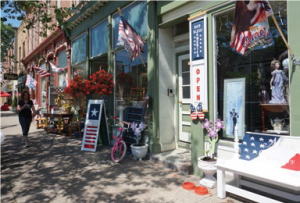 Ten years ago, downtown Mount Morris had gone the way of so many of our small villages and towns with the rise of the internet and big box stores, with over fifty percent of the storefronts vacant and the buildings in disrepair. Worst of all was the perception that nothing could be done about it. And then Greg O’Connell appeared. A 1964 SUNY Geneseo graduate, O’Connell had the vision and experience to turn Mount Morris around. Greg purchased 20 downtown buildings in 2008, renovated and rented them. When Greg buys a building and restores it, he doesn’t just rent it to the first person who shows interest: he targets a good mix of retail businesses, helps them out with an affordable rent, and requires them to have consistent hours of operation. He also wants them to keep lights on in the second floors to show that the downtown is still alive after the businesses close. Greg O’Connell is anything but an absentee landlord! He created a true partnership with not only the community but also the Livingston County Development Corp (LCDC). Transforming investments in heritage assets into new economic possibilities. That really sums it up. The Landmark Society is proud to be a part in the partnerships transforming this area of our region. This entry was posted in Success Story by Amanda Delle Donne. Bookmark the permalink.